In a recent opinion that upheld a trial court’s decision, a claim for damages made by a disabled woman after she was injured while riding public transportation will now proceed toward trial. The events at the center of the case titled Houston v. New York City Transit Authority occurred on a public Access-A-Ride vehicle operated by G.T.J. Company and TFM Paratransit, and owned by New York City Transit Authority (NYCTA). The injured woman, Thelma Houston (who died while the lawsuit was ongoing for unrelated reasons), was attempting to board the Access-A-Ride vehicle at the time of the incident. The vehicle had stopped for Houston, and she had used the vehicle’s motorized ramp to enter it while seated on her motorized scooter, then used the scooter to drive off the lift and into the vehicle. The driver then exited the vehicle to fold the lift, during which time Houston fell over and became injured. In later deposition testimony, she admitted that she “somehow” lost her balance, but did not “know what happened” to cause her to fall. Houston filed a claim for damages against NYCTA, G.T.J. Company, and TFM Paratransit. She claimed that the driver of the Access-A-Ride had not followed proper procedures in helping Houston safely board the vehicle, and that the lift had malfunctioned, causing her to fall. After Houston died, the administrator of her estate stepped in to pursue the claim on Houston’s behalf. The defendants requested that the court dismiss the claims before trial by filing a motion for summary judgment. The defendants pointed out that Houston was already in the vehicle and moving under her own power when she fell, and that the driver offered all reasonable assistance in helping Houston enter the vehicle. The trial court ruled that questions remained regarding whether or not the driver followed procedure in helping the plaintiff onto the vehicle, and the Appellate Division agreed. The Appellate Division pointed out the manner in which a driver’s responsibilities change when the driver can see that a passenger needs extra assistance: “With respect to a passenger with a disability, a common carrier has a duty to use such care or to give such assistance for his or her safety and welfare as is reasonably required by the passenger’s disability and the existing circumstances[. ]” The opinion noted that there was evidence that the driver might not have done everything she should have under proper procedure to ensure that Houston was securely inside of the vehicle, and that she was moving to the spot where her scooter would be restrained during the ride, prior to leaving the vehicle. Since the court concluded that there were still issues of fact to be determined by a jury or judge at trial, the Appellate Division affirmed the denial of the defendants’ request to dismiss the claims. 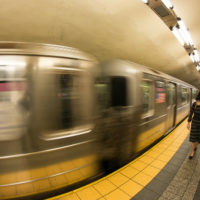 If you’ve been injured on public transportation in New York, seek legal help obtaining the compensation you may be owed for your injuries by contacting the effective, determined, and trial-ready personal injury attorney Leandros A. Vrionedes for a consultation, in Manhattan at 212-889-9362, or in Queens at 718-777-5895.